Do you need more, qualified finance or insurance leads but can't afford to bid more? Is your cost per lead too high? If you answered yes to either question, the solution is to improve the conversion rate of your landing pages. Acquire combine responsive PPC landing page design with rigorous, ongoing A/B split testing to outperform your existing landing pages and improve ROI. 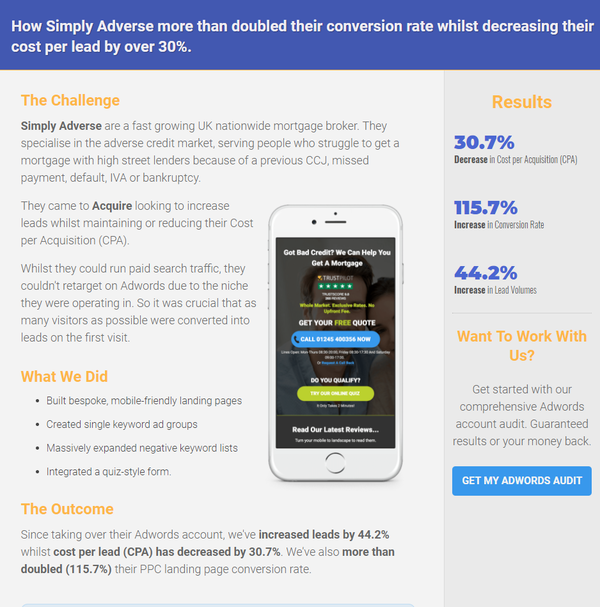 Discover how our bespoke landing page design helped Simply Adverse increase their website conversion rate by 115% whilst decreasing their cost per lead by over 30%. Landing pages are critical to your success with PPC advertising. They can literally make or break a campaign. To maximise conversions, your PPC landing pages must establish trust and credibility, load fast, and guide your visitor to perform the action you want them to take. Acquire design beautiful, mobile-friendly and conversion-focused landing pages to do exactly that. Then we optimize your new landing page for maximum results. Our iterative process starts with us coming up with testing hypothesis based on studying analytics, heatmap, survey and other data. Then we split-test each idea to a minimum 95% statistical significance, see what works and what doesn't, then rinse and repeat with a new hypothesis. Thanks to the power of compounding, even just a few small wins can lead to big improvements in conversion rate over time. What happens after a visitor clicks your ad is just as important as the ad itself. That’s why we pair our strategic PPC campaign management with beautiful bespoke landing page design and ongoing A/B split testing. And that’s why we track the conversion funnel all the way through to sale. So we can optimize your Adwords and Bing campaigns based on the keywords, ads, landing pages, device types and other data that actually drives revenue for your business. We constantly test headlines, calls to action, images and other elements to generate wins that compound into significant conversion increases. Our split tests are built on solid data, not guesswork. We use surveys, heatmaps, scrollmaps and analytics tools to come up with working hypothesis. Landing Page Conversion data is pushed into your CRM, so we can track your sales and optimize your landing page tests accordingly. Why are PPC and landing page design and testing bundled as a package? Because landing page testing is essential to get the best results with PPC. Having control of the landing page design allows us to quickly implement changes and tests so you see improvements fast. We do however offer landing page design and testing as a standalone service. 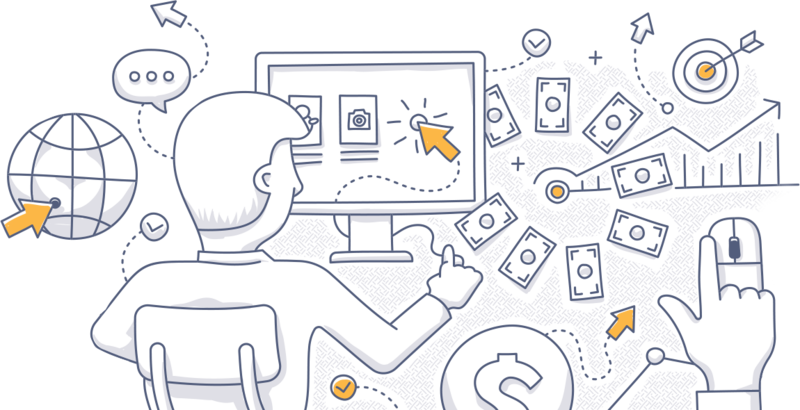 What if I only want PPC management? 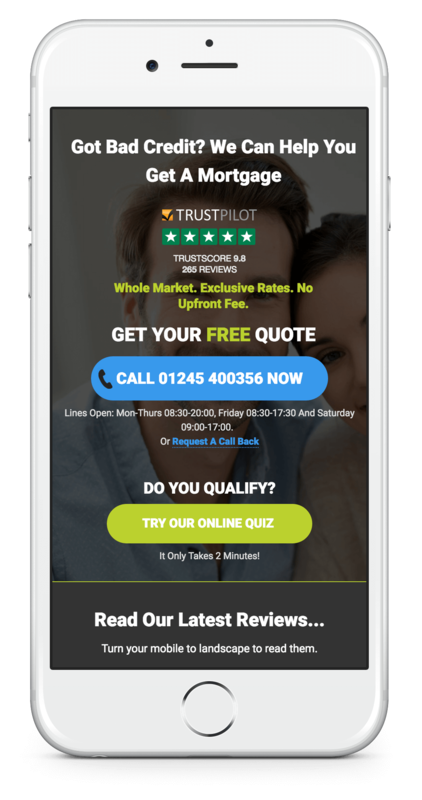 We’ll probably offer the landing page design and testing at no extra charge, since it goes hand in hand with PPC. It depends on the scope of your requirements. However we always strive to provide you with an amazing return on investment. Our fee is fixed at a flat monthly rate, rather than percentage of ad spend, so there are no hidden surprises. Who owns the landing pages? You do, always. Whilst we usually host the landing pages for testing, we export them to your web server should you ever decide to leave. What PPC advertising channels do you work with? Will I be kept abreast of what you are doing? Absolutely. Besides our weekly management reports and KPI Analytics dashboards, you retain login access to your own Adwords, Bing & Facebook accounts. And we’re always available on email or phone if you want to discuss something. What’s your minimum contract length? 3 Months initially with a rolling 1 month period after that. We’re ready when you are. Give us a call on +44(0)117 200 1409 or complete our proposal form and we’ll get the ball rolling. We specialise in helping service based and Software-as-a-Service (SaaS) businesses. Typical service verticals include, but are by no means restricted to, health, financial, solar, travel, insurance, education, automotive and legal. Not sure if we can help? Drop us a line and we’ll let you know.